A story of slavery, set in the 1930s American South. After gangster Mulligan's cars colony, fleeing northern justice, finds a hiding place in Alabama, spoiled, naive daughter Grace refuses to travel on after seeing the Manderlay cotton plantation being run under slavery rules, called Mam's law, inclusive flogging. She keeps half of dad's goons as guard to force the dying matriarch-owner's heirs, which she shamelessly dispossesses and reduces to 'staff', to taste destitution under absurd, gun-imposed contracts. The 'slaves' are made free partners, supposed to vote for progress after lessons from Grace. But almost all her democracy-pupils prove fickle, dumb and selfish, except old Willem. Her and their ignorance in Southern planting and crafty Dixie ways means more problems are created then solved. By the time dad returns to pick her up or abandon her for good, she's the one who has learned and changed the most. Taglines: Liberation. Whether They Want It Or Not. The second film in Lars von Trier's third trilogy series entitled "USA - Land of Opportunities". The two other parts are Dogville and Wasington (2009). Narrator: It was in the year of 1933, when Grace and her father were heading southward with their army of gangsters. 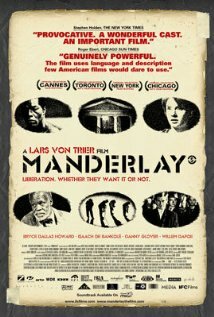 Manderlay 9/10 Introducing this 'Part 2' of the von Trier American Trilogy, actor Danny Glover said, ¨The process of storytelling is an enormous responsibility and opportunity.¨ It is one that director Lars von Trier takes very seriously, constantly seeming to question his role and duty as an artist  and whether the duty is to the audience or to art itself. 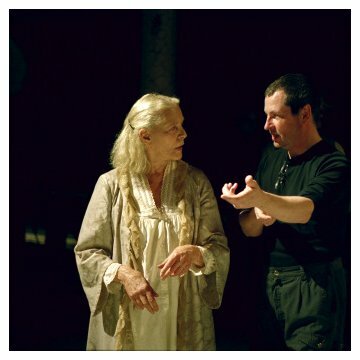 Both with his Dogme movement films and now with later works such as Dancer in the Dark, Dogville and Manderlay, his answer seems to be firmly towards art as a worthy end in itself  or at least as a serious medium by which to raise (though not answer) questions of social conscience. He makes little or no concessions towards audiences who are not interested in what he has to say. Manderlay a story about emancipation from slavery (and on a deeper level, of the more topical problems of introducing democracy), continues the Dogville tradition of using Brechtian acting and a semi-bare stage. The immediate dissociation this brings from any semblance of everyday reality, focuses our attention on the issues, in a similar way that Greek tragedy or grand opera is able to do  by insisting that ordinary details are secondary or even irrelevant to the main theme. 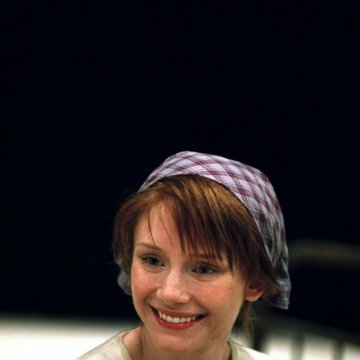 Grace (played by Bryce Dallas Howard, who takes over seamlessly from Dogville's Nicole Kidman) travels across America with her father and comes across an isolated town where slavery has not been abolished. With a pure heart, god intentions, and the power of her father's lawyer and henchmen behind her, Grace makes well-meaning but unfortunate, ill-informed attempts to put things right. She never stops to question the fact that she knows best, or whether her high moral values are appropriate or whether they will win the day. Not unexpectedly, there is much trouble in store for her. Manderlay's high points are that it is deeply philosophical but at the same time highly coherent and accessible. It asks important and necessary questions about the nature of freedom and democracy. Such questions, and the discussion which this film makes possible, are urgently needed in the light of such unsolved dilemmas as Iraq, the philosophical basis for the removal of Saddam Hussein, the introduction of western-style democracy to countries like Iraq (or even Afghanistan). The broader practical problems (also tackled by Manderlay) of how to restore power to those who have been disenfranchised, whether by slavery, colonialism, dictatorships or market forces, is one that applies to many countries, irrespective of the morality involved. The weakness of Manderlay is that the USA (and its internal and foreign policy) is an ideal example for any artist tackling such issues  as it's visibility provides a common focus throughout the world. Sensitive American citizens (and politicians) however will mistakenly see the film as simply anti-American (which is not too difficult) and avoid it. This means the people in power who most need to see it (as they need such fora to find answers) will probably avoid it. But von Trier has discharged his duty as one of the most intelligent artists of our time. He has discarded sensational entertainment, using art as a tool to help us think outside the square  and his thinking is both profoundly stimulating and fully accessible to those with the patience and inclination. Does art need to tantalize our senses? If so we would miss out on some of the finest literature, the greatest plays, anything that did not provide immediate sensory satisfaction. 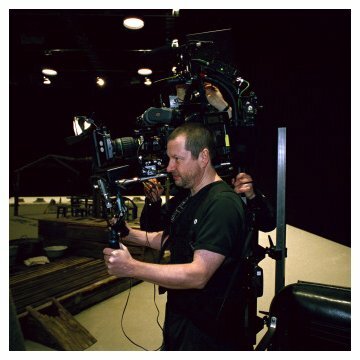 Works such as Manderlay help to firmly position cinema as one of the great intellectual arenas of art  one that has the power to inform, enrich and enlighten.